Siberian cats are kind in nature, intelligent and love to be near you, has been my way of describing this wonderful breed since first welcoming a Siberian kitten into my home. They are content to have a paw touching you or perhaps sleep on your desk while you work. Our Siberian cats are gentle, loving and playful, regardless of their age. Siberian cats enjoy the companionship of children as well as your families pets. 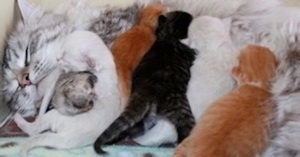 The gentle temperaments of our breeding lines has allowed us to place several of our kittens in homes as therapy cats. My mission is not to produce the most kittens, not to have the most sales, but rather to do this well, to do the best job I can for my cats, my kittens and my kitten buyers. I work closely with several like minded breeders in the midwest as well as several other states, to share information, educate and be of support to one another. Over my many years of breeding Siberian cats, I have built lasting relationships with breeders from other parts of the world as well. We raise our cats and our kittens in our home. I share my art studio with my kittens where they are raised under foot receiving daily love and attention. I enjoy their company while I work and during the occasional nap in my oversized chair! Siberians are considered hypoallergenic, as many people with cat allergies may have little or no reaction to them. We have found this to be true within our own family. I myself am allergic to cats. 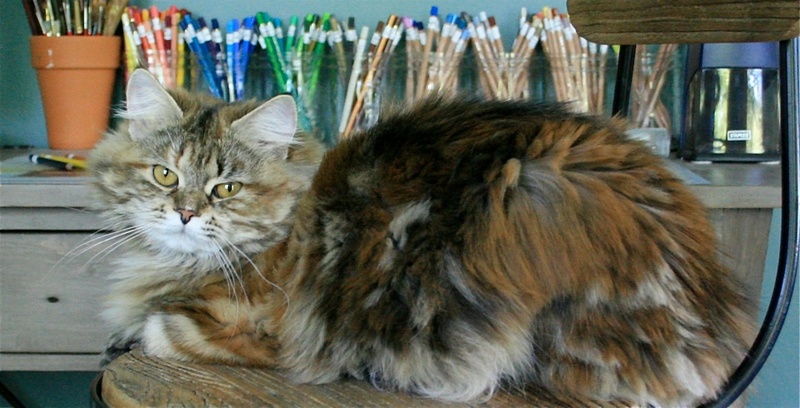 The exceptional personality of the Siberian cat along with it's beauty is really what makes this breed stand out. The low allergen quality of the Siberian is a bonus, the frosting on the cake if you will. Deedlebugs Siberians goal is to breed low allergen Siberian kittens with loving temperaments.